This article will introduce how to increase size of system partition when Diskpart was unable to get it expanded on Windows Server 2012. Download IM-Magic Partition Resizer Server to extend C drive space on Windows 2012 when it says Diskpart cannot extend the partition. Windows 2012 Diskpart command has the ability to extend partition, but it cannot extend C drive system partition. If you have not gotten a useful way to fix the low disk space problem on C drive, you can use IM-Magic Partition Resizer Server. It is a partition tool which can work on Windows Server system to help resize hard disk when partition runs out of disk space. This partition software can shrink partition and extend partition with original disk data untouched. You can rely on this partition software to extend system partition on Windows Server 2012 and Windows 2012 R2 and other Windows Servers. "How to fix the problem when Windows Server 2012 says that C drive is running on low disk space? 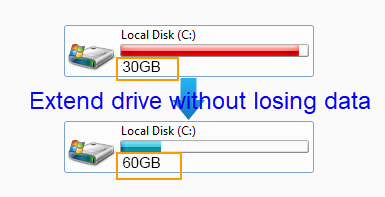 There are two partitions on my PC, namely C drive and D drive. Besides, there is about 30GB unallocated space which shows behind D drive. I tired to run Disk Management to add the unallocated space to C drive, but the Extend Volume is grayed. Then, I run Diskpart command to extend the partition, but it says the selected partition cannot be extended. What should I do to move the unallocated space to C drive in Windows 2012?" "I need to increase the size of C drive because it is nearly full on my computer. Can anybody tell me the method to extend C drive on Windows 2012 without repartitioning hard disk or deleting any data? All files stored on C drive are important and operating system is also installed on this partition. Thanks for your kind help!" Why Diskpart Cannot Extend C Drive on Server 2012? Diskpart cannot extend volume on Windows Server 2012, but why you failed to extend C drive by running Diskpart command? If you want to rely on Diskpart command to extend a partition, one of the most important things is that unallocated space is always needed. If there is no existing unallocated space, you need to squeeze some from other partitions on the same hard disk. When there is unallocated space, you still need to move it close to the partition you need to extend. The other important point is that Diskpart command only supports to extend NTFS data volume. In the other words, if the partition you want to extend is system partition or has FAT32 file system, Diskpart will fail to extend the partition. Since Diskpart cannot extend system partition C drive, another solution for C drive resizing on Windows Server 2012 is to rely on partition software. 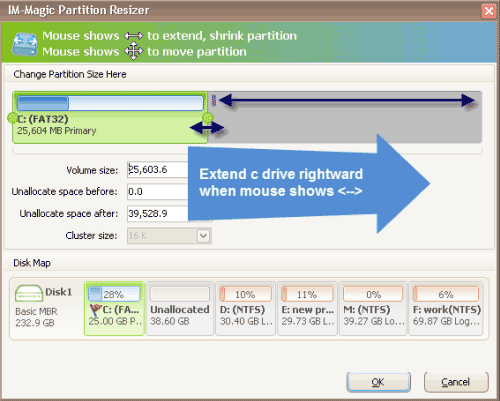 The partition software enables you to shrink partition to get some unallocated space and then add the space to C drive. By using partition software, you can resize C drive without reinstalling system or reformatting hard disk. This partition software allows you to resize hard disk effectively on all Windows Server operating system including Windows Server 2012. No matter how much you have stored on the disk partition, the partition software helps redistribute hard disk with all data untouched. This partition software supports both NTFS and FAT32 file system. Usually, C drive is also known as system partition, so you cannot simply delete files to free up disk space on C Partition. But you can run Windows built-in disk cleanup tool to delete some Internet temporary files, cookies and caches, etc to free up disk space on C drive. In addition, you can uninstall some unnecessary programs. Many people would like to install programs on C drive. When they do not want to use the program, they just simply delete the program. As a matter of fact, if you want to delete a program from your PC, you should uninstall it. If you just simply delete it from Desktop, it cannot delete the program completely and it will still occupy disk space.